Watch: Howard Schultz said he wasn't running for president. Many times. Howard Schultz is leaving Starbucks — and says he may consider running for president. Starbucks (SBUX) announced Monday that Schultz will step down later this month as executive chairman, the end of a 36-year run at the company. In an interview with The New York Times, he acknowledged that he may consider a bid for the White House. "I want to be truthful with you without creating more speculative headlines," he said. "For some time now, I have been deeply concerned about our country — the growing division at home and our standing in the world." Schultz later told CNN's Poppy Harlow in a statement: "I intend to think about a range of options, and that could include public service, but I'm a long way from making any decisions about the future." Schultz, 64, one of the most politically outspoken corporate leaders in America, has been rumored before as a potential Democratic candidate. He endorsed Hillary Clinton for president in 2016. "On the other side," he told Harlow that September, "I think we've seen such vitriolic display of bigotry and hate and divisiveness, and that is not the leadership we need for the future of the country." Last summer, he criticized President Trump after Trump said that both sides were to blame for violence at a white supremacist rally in Charlottesville, Virginia. "My fear is not only that this behavior is being given permission and license, but its conduct is being normalized to the point where people are no longer hiding their face," Schultz said. Schultz has spoken frequently about race, and Starbucks has taken progressive stances on social issues — including gay marriage, immigration and Trump's travel ban. Last year, the company said it plans to hire 10,000 refugees over five years. Starbucks has also been a leader in workers' benefits under Schultz. Since 1988, Starbucks has offered health care to all full-time and part-time employees. In March, the company said it reached gender and race pay equity for all US employees. "Schultz has been a pioneer in setting and maintaining a culture of social responsibility — both environmentally and socially — while being able to maintain financial performance," Tim Hubbard, a management professor at the University of Notre Dame's Mendoza College of Business, said in an email. Schultz has overseen enormous growth in three and a half decades at Starbucks. It has expanded from 11 stores in the early 1980s to more than 28,000 stores in 77 countries today, and a market value of $78 billion. Schultz started in 1982 and served as chief executive from 1987 to 2000 and again from 2008 to 2017. He is leaving at a tumultuous moment in Starbucks' history. The company drew protests in April after two black men were arrested while they were waiting inside a Philadelphia store. Starbucks closed 8,000 stores for an afternoon last week to teach employees about racial bias. "We realize that four hours of training is not going to solve racial inequity in America," Schultz told Harlow last week. But he said, "We need to have the conversation. We need to start." Schultz has addressed race before. After the police shooting death of an unarmed black man in Ferguson, Missouri, in 2014, Starbucks asked baristas to write "Race Together" on coffee cups in hopes of starting conversations. "It's not going to solve racism, but I do believe it is the right thing to do at this time," Schultz said at the time. And in a speech to Starbucks shareholders in 2016, Schultz said he feared that the opportunities that allowed him to achieve his American Dream — he grew up in subsidized housing in Brooklyn — have escaped the grasp of too many people. "The American Dream can't be only accessible to people of privilege who are white and live in the right zip code," he said. 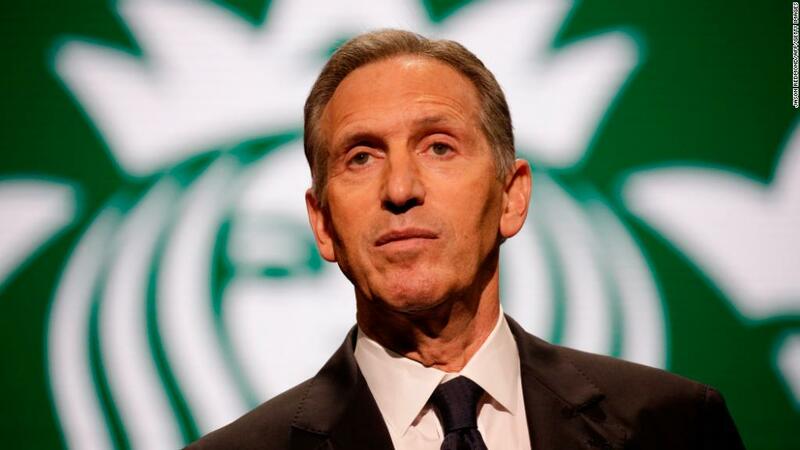 In an email to Starbucks employees, Schultz did not address a future in politics. He expressed gratitude and encouraged the employees to foster a "sense of community and human connection." "I still feel like a kid from Brooklyn who grew up in public housing," he said. "I am living the American Dream." Schultz moved from CEO to executive chairman last year. Kevin Johnson has been CEO since then. Starbucks said Monday that Myron Ullman, former CEO of JCPenney, will become the next chair of Starbucks' board. Mellody Hobson, the president of Ariel Investments, will become vice chair.